In my last post, I explained how the academics behind the job polarisation literature (declining middle class) have given us a framework for understanding the emergence of very clear winners and losers in the modern workplace. Yet most of these scholars have refused to extend their analysis to justify any fear of technology-led mass unemployment. According to these economists, the disappearing middle class —due to the death of white collar routine cognitive work carried out by office employees and blue collar routine manual work performed by factory employees—will reappear in cognitive non-routine or manual non-routine jobs. In so doing, these academics have generally wasted few opportunities to bash lump-of-labour advocates; that is, those people who believe that there exists a fixed pool of jobs that computers are draining away. Nonetheless, there are cracks in the facade. For example, back in 2003 Paul Krugman (who has acted as a commentator on the job polarisation literature rather than an originator) was rock solid behind the consensus economic profession position as can be seen here. But by December 2012 we see a significant U-turn in a piece called Rise of the Robots in the New York Times. However, I would say that the consensus, while shaky, is still in place. Moreover, for a high-voltage polemic against the lump of labour theory, I recommend you read “Are Robots Taking Our Jobs, or Making Them?” by Ben Miller and Robert Atkinson of the Information Technology and Innovation Foundation. Like all good polemics, the essay assembles all the evidence that supports their thesis of ‘don’t worry, be happy’ and omits any evidence that contradicts it. Nonetheless, it is a good, comprehensive exposition of the consensus position of the economics profession that has dominated thinking for decades. Further, we can actually take their analysis, but subvert it somewhat to fit the facts of what is actually happening in the job market, and from there think about solutions. Both history and scholarly analysis have clearly and consistently refuted the notion that increased productivity leads in the moderate to long term to higher unemployment. This is because rising productivity increases overall wealth, and in a competitive economy that increased wealth gets reallocated to create additional demand that requires new workers. This view (the view that productivity can kill jobs) fails to recognise that the savings from new productivity gains must flow back to the economy in one or more of the following three ways: lower prices, higher wages for the fewer remaining employers or higher profits. Indirect effects occur when technological improvements increase demand and lower the prices consumers pay for their goods and services, thereby giving them more purchasing power and stimulating growth in other sectors, which leads to self-reinforcing economic expansion…. ….It is possible that some or all of the savings go to the workers in the firm in the form of higher wages. And in this case, they would spend the money, creating demand that will be met by more employment. Some of the savings might go to higher profits, although in competitive markets, little of it will. But even if all of it were to, the higher profits are distributed to shareholders and are spent, likewise creating demand. Even if the savings from productivity don’t get spent spent by consumers and for some reason are saved, this will still create jobs, assuming the economy is not in recession. The reason is that increased savings lead to lower interest rates which in turn lead to increased investment. 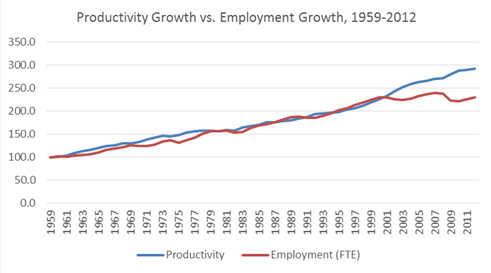 The authors then go on to reproduce the following chart from Jared Bernstein’s blog that builds on the analysis of Eric Brynjolfsonn and Andrew Mcfee of MIT in “Race Against the Machine” (click for larger image), but with a twist: they argue that there has never existed any positive correlation between productivity growth and unemployment growth in the past. Miller and Atkinson feel that they can deal a knock-out blow to the new neo-luddites by pointing out that the recent slowdown in productivity has co-existed with a rise in unemployment. 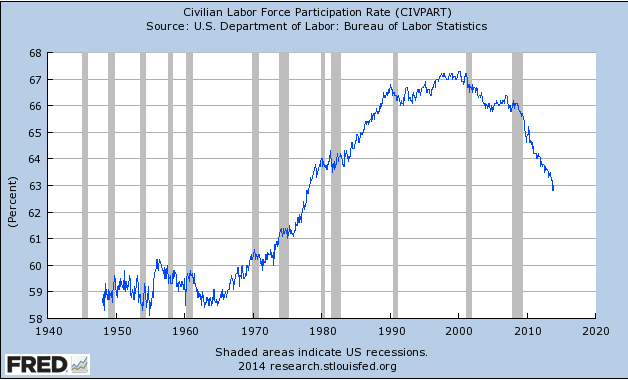 Conversely when productivity surged in the 1990s on the back of the IT boom, unemployment fell markedly. As regards the last observation, I would point out that the job polarisation literature sees the shrinking middle class (carrying out routine cognitive and routine manual tasks) as a phenomenon that can be dated to around the year 2000. Further, the aggregate productivity data is masking a major divergence between productivity in the manufacturing sector, which is chugging along quite nicely, and the non-manufacturing sector, where productivity growth is missing in action. We really are experiencing an inevitable shift to a post-industrial, Information Age economy where manufacturing’s importance to output and jobs is declining, similar to the trend in agriculture over the last century. Manufacturing’s declining share of output isn’t a sign of economic weakness—it’s just the opposite. It’s a sign that advances in manufacturing productivity and efficiency are translating into lower prices for consumers when they purchase things like cars, food, clothing, appliances, furniture, and electronic goods. 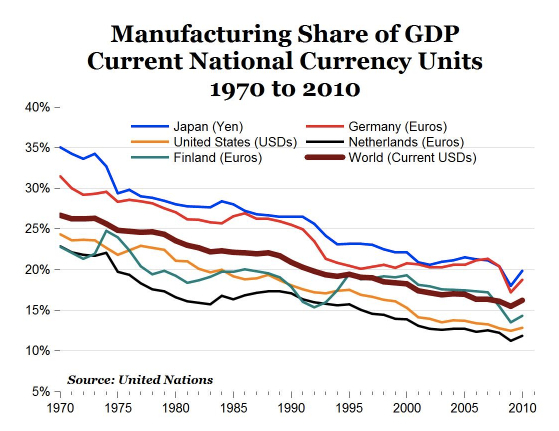 In the U.S., the price of goods relative to services fell by 52 percent between 1970 and 2010, so it’s not surprising that manufacturing’s importance in the economy has fallen significantly. As spending on manufactured goods as a share of household income declines, it raises our standard of living, and for that “decline in manufacturing” we should celebrate, not complain. The trend is also an example of what I would call ‘diminishing returns to stuff’. As the price of ‘stuff’ comes down, we demand more of it, but, critically, we also transfer some of our enhanced purchasing power obtained from lower ‘stuff’ prices into buying more ‘non stuff’ (that is why the share of manufacturing in GDP has shrunk). Now lots of ‘non stuff’ is made by non-routine cognitive workers and non-routine manual workers (see my post here). If that displaced demand was dispersed across these two categories, then Miller and Atkinson’s assertion that increased productivity is a win-win all round would be correct. But it isn’t dispersed: it’s concentrated in demand for the services produced by non-routine cognitive workers. This can be seen in the following chart from a wonderful paper by Frank Levy and Richard Murnane called “Dancing with Robots: Human Skills for Computerised Work” (click for larger image). 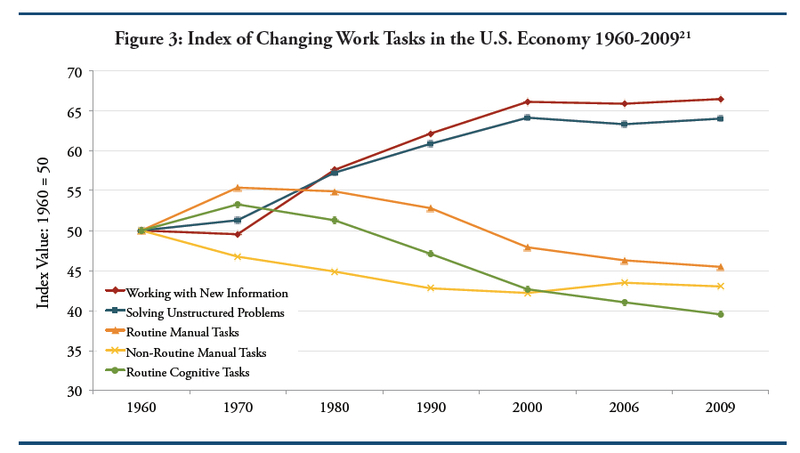 Value-added of non-routine manual tasks is flatlining, while the value added of non-routine cognitives (in the chart divided into those who work with new information and those who solve unstructured problems) has kept moving higher. Further, as the value-added of the routine jobs falls, workers have to migrate into the cognitive area or into the non-routine manual area. This, in turn, is highly dependent on education: college drop-outs, high school grads and high school drop-outs all will find their path to the non-routine cognitive El Dorado stymied by a lack of education. So these workers end up fighting over a stagnant pool of non-routine manual jobs, with the result that a) they depress wages and b) some drop out of the job market altogether. So we are now ready to push back on the Miller and Atkinson ‘don’t worry, be happy’ thesis. First, the income gains accruing to the non-routine cognitives who are complementing the new technology are not being spent on employing the services of non-routine manual workers. 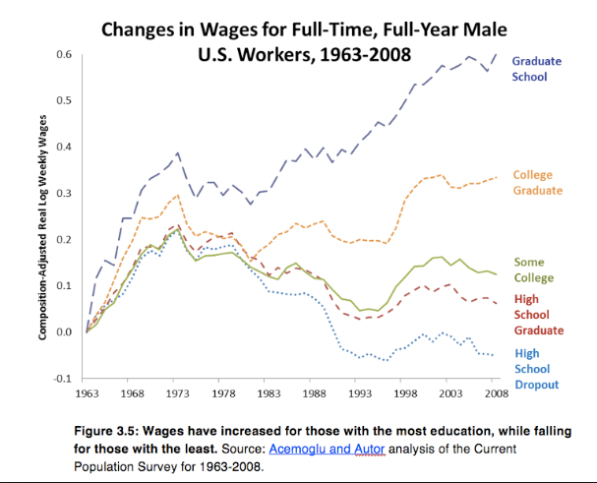 If it were, we would see it in the wage and employment data. 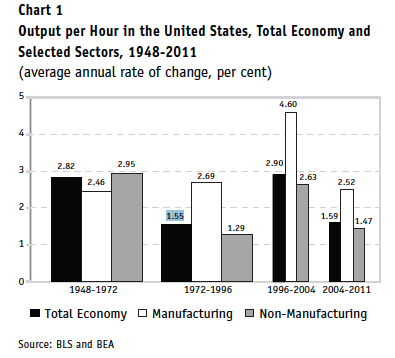 Second, the productivity gains are concentrated in manufacturing, which is giving us cheaper stuff. But for non-routine manual workers, the gains from being able to buy ‘stuff’ more cheaply are not sufficient to offset the losses to them due to stagnating/falling wages and unemployment. This is because a) ‘stuff’ only occupies a limited proportion of household spending, and b) ‘non-stuff’ like education, medical services and so on is going up in price. In other words, real median wages are falling in the U.S. due to stagnating nominal wages and rising nominal prices, see my previous post here for a median wage chart. But, at the end of the day, technology-led productivity gains are, well, gains: we are able to make more ‘stuff’ for the same input, or the same amount of ‘stuff’ for less input, or more ‘stuff’ for less input—whatever it is, it should all be good. And those gains have got to go somewhere. So we should look at Miller and Atkinson’s analysis and “follow the money”. If the gains aren’t going to the non-routine manual workers, they must be going to the non-routine cognitive workers or to the holders of job-eating technological capital. Unfortunately, Miller and Atkinson leave out the fact that the latter two recipients are one and the same thing, since it is the cognitive elite who hold the lion’s share of financial capital that owns the technology. 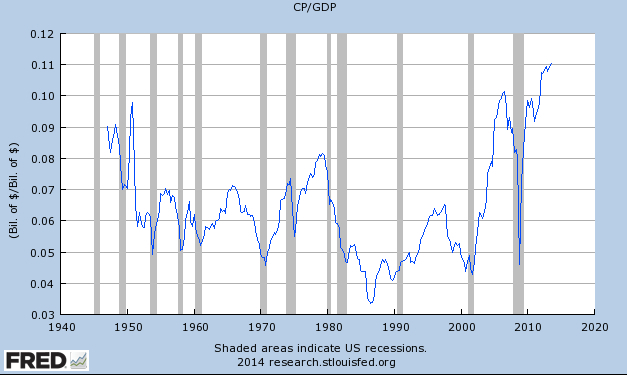 From the Federal Reserve Economic Data (FRED) again we see that corporate profits are on a roll, which is one factor behind rising stock prices. In some ways, the success of corporations in harvesting more profits at the expense of wages appears counter-intuitive: shouldn’t the free dissemination of information favour perfect-competition-type markets that would drive profits down? The answer to this lies in a future post, but I would hazard a guess that technology may promote economies of scale and the natural formation of oligopolistic markets, which in turn leads to monopolistic-type profits at the expense of wages and falling prices. Nonetheless, given where we are, policy makers have two avenues open to them in preventing the emergence of an ever richer non-routine cognitive elite and an ever poorer rump of non-routine manual poor. They can 1) turn the non-routine manuals into non-routine cognitives through education or training, or b) they can redistribute some of the gains from the non-routine cognitives to the non-routine manuals. It sounds easy, but it isn’t. I will work through the pitfalls to policy implementation in my last post on the topic. This entry was posted in Post Growth, Technology and tagged Andrew McAfee, Are Robots Taking Our Jobs?, Ben Miller, Dancing with Robots, Erik Brynjolfsson, Frank Levy, Paul Autor, Paul Krugman, Race Against the Machine, Richard Murnane, Robert Atkinson, The Information and Technology Foundation, The Rise of the Robots. Bookmark the permalink.